A pairing is a trusted relationship with another device, where a computer is granted privileged, trusted access on the iPhone. In order to have the level of control to backup the phone, download personal data, install applications, or perform other such tasks on an iOS device, the machine it’s connected to must be paired with the device. This is what iTunes and Xcode do to talk to the phone, but also what forensic imaging tools and a number of free hacking tools do as well. Once paired, these keys remain stored on the device indefinitely, until you perform a restore or wipe the phone some other way. NOTE: As of iOS 8, you can reset all pairing relationships by using Settings > General > Reset > Reset Location & Privacy, or Reset Network Settings. This will delete your existing pairing relationship with your desktop (and all other computers), however it will not remove the pair-lock. This means you will have to remove the pair-lock in order to pair with your own desktop again. This can only be done using either Configurator’s supervisor certificates, or by entering a removal password that you may set when you set up the lock. Pairing records can be used to access the phone even when it’s locked, over USB (and in iOS 7 and older, over WiFi). A pairing record is like a skeleton key to your iPhone or iPad. With it, someone can download all of your personal data from any application (including third party applications), install invisible applications (even onto your non-jailbroken phone) that run in the background, activate the device’s built-in packet sniffer to monitor your network traffic, and much more nefarious things. Much of this can also be done while the device is locked, regardless of whether you’re using a fingerprint reader or not, as long as you have a pairing record. Some level of personal data can also be acquired from the phone regardless of whether backup encryption is turned on or not, and a number of forensics tools and open source tools (like iMobileDevice) know how to get to this decrypted data. So what’s the best way to protect yourself from all of these? Pair-lock your device. By pair-locking your device, you’re preventing anyone from establishing a new trusted relationship with the device. So unless they’re able to steal the pair record your desktop has, they won’t be dumping data from your phone, installing malicious applications, or doing anything else to it – even if the phone leaves your physical possession, and even if you are compelled to give up the passcode, or unlock it with your fingerprint. When a device is unwilling to create a new pairing session with a desktop machine, nothing can talk to it through its proper interfaces – not forensics tools, not iMobileDevice tools, nothing. And that means unless you have a really old phone with a hardware exploit, there’s no way they’ll be able to dump data from it, since Apple’s no longer able to service warrants either for iOS 8 devices. As I said, in order to get to the data on your device, you’ll need the pair record from your desktop. This means that you should be encrypting your desktop machine if you want to protect that relationship. It also means that you should be aware that you, yourself, will be unable to access your device if you lose this pairing record. On a Mac, you’ll find a copy of your pairing record in /var/db/lockdown. Guard it well… Maybe even off the computer if you don’t sync often. I had previously documented a method to install profiles on the device without first supervising it, but it looks like the pair-lock feature does not carry over onto the device unless you have supervised it. Unfortunately, you’ll need to supervise your device in order to pair lock it. One big caveat to supervising your device is that you cannot under any circumstances restore a backup of data from the device from before it was supervised, otherwise you’ll undo everything. What this means is that you have to start fresh, with a brand new install of iOS. There does not appear to be any way around this, meaning you’ll lose everything on the phone (and have to start from scratch). 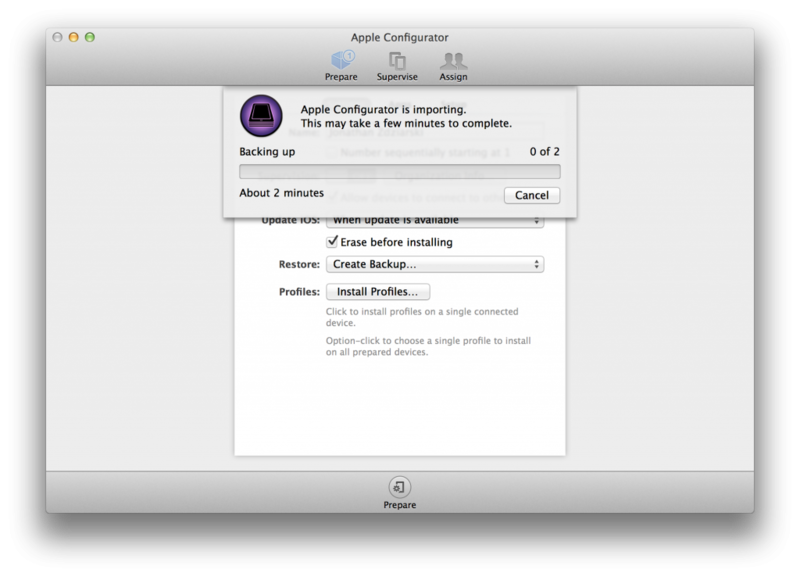 If you decide later that you don’t want to supervise the device, you can, however restore an iTunes backup. This will blow away the supervised configuration, and also your pair lock, but it will let you restore all of your backed up content. To get started, the first thing you’ll want to do is disconnect your iDevice from your computer, then Reset Location & Privacy. This will flush out any existing pairing relationships the phone has with other desktop machines. This is important, in the event that any existing pairings have been created that you don’t want (or might not know about). Once you’ve reset privacy settings on the device, plug it back into your desktop computer, and it will establish a new pairing relationship with it again. This will create a file on your Mac in /var/db/lockdown with a filename named after the UDID of your device. If you don’t know what that is, you can open iTunes and click on the serial number of the phone to display the UDID. You might want to back up this pair record somewhere secure, as it will be the only one capable of talking to the phone. One last thing you’ll want to do to get started it turn off Find my iPhone. Configurator won’t provision a device until you’ve done so; you can turn it back on once you’ve got everything set up. Once you’ve got your pairing reset, download the latest Apple Configurator from the Mac App Store. This is a free download. This article has been updated specifically for Configurator 1.6 on iOS 8. The Configurator is designed to enroll devices in enterprise (corporate) profiles, to place restrictions on them and allow them to be supervised by a security team. You’ll be using it to enroll your own device in your own private security policy. Before you do anything to configure an iPhone, visit the Configurator’s Preferences, and turn off the feature that tells Configurator to uninstall applications that it doesn’t specifically install. If you don’t do this, then the next time you connect your device to Configurator, it will forcibly remove everything you’ve installed since you provisioned it (ouch!). Turn the following feature off before proceeding. When a device is managed by with Configurator, you can’t restore from an iTunes backup. If you do, it will blow away the user data on the device, which includes your managed configuration (and pair lock). If you’d like to create an additional backup archive of your data before proceeding, you can do this in Configurator just to be safe. From the Restore menu, select the Create Backup option. This will prompt you to save a backup archive to your computer. To manage a device, you’ll need to first prepare it. This will cause Configurator to erase the device completely, download and install the latest copy of iOS onto it, and “reset” the device into a supervised mode. From the prepare screen, switch the Supervision switch to the on position. Your console should look similar to the one below. Decide if this machine is the only machine you’ll ever, and I mean ever, want to pair this phone with. If it is, then un-check the checkbox named, Allow devices to connect to other Macs. If, on the other hand, you might want to allow this phone to some day pair with other computers, then leave this box checked. I leave mine turned on, and instead manage that restriction through a profile, simply because my laptop could unexpectedly get stolen, or fail. In those cases, I can use the password removal option in the profile to remove the pair lock, so that I won’t have to erase my phone to un-manage it. If you’ve opted to allow the device to (sometimes) connect to other computers, you’ll next want to create a profile, which you’ll use to lock and unlock the pairing. Enter a name for your supervision profile. I simply call mine “Managed Device Profile”. Regardless of which option you use, you’ll create a new profile, which will contain your pairing restrictions. If you want to be able to remove the profile from the device, you can set a password required to remove it on the device, or for best security, select Never. NOTE: If you live in, or plan to visit a country whose courts can compel you to give up your profile’s removal password, it would be best to select the Never option, so that you cannot be held in contempt of court for not giving up your password. Next, click on the Restrictions tab and scroll down to the restriction titled Allow pairing with non-Configurator hosts (supervised only). This is your lock switch. To disable any new pairing with the device, uncheck this restriction. Later on, you’ll be able to edit this profile whenever you want to pair the device with a new host. NOTE: Other restrictions, such as iCloud restrictions, can help to ensure that the device never backs up to the iCloud, or uses the photo stream option. It is also a good idea to force encrypted backups. You can enable these and other restrictions depending on the level of security you want to guarantee on the device. Once you’ve finished making these changes, save the profile. If you’re simply installing it on a device as an unverified profile, the device will prompt you to install it. When you are finished setting up the profile, click the Prepare button at the very bottom of the Configurator. The Configurator will then download and re-install the iOS firmware, then set up your device to be managed. If you open up Settings on your device when view the Profiles under General, you should see your pairing profile, and a restriction preventing the device from pairing with any new devices. If you set the profile up to be removable with a password (or Always, even), then you can remove the pairing lock at any time by just tapping remove. For ultimate security, set the removal to Never. Keep in mind, if you ever lose the supervisor certificates in your desktop’s keychain, you may have to wipe your device in order to get the pairing profile off of it, which also means that if you lose (or wipe) your laptop, you will not be able to talk to it with a new machine until you wipe. Now lets say a few months go by and you decide you want to pair your device with a computer at work, or some other machine. If you set a removal password on the profile, you can enter that and simply remove the lock. If you didn’t, then you’ll only be able to remove the lock if you’ve supervised the device, which uses special supervisor certificates to authenticate on the device (stored on your keychain). To unlock the pairing in this fashion, you’ll need the computer you originally set this up with (unless you’ve backed up your pairing record and set up Configurator somewhere else). Launch the Configurator and click on the Supervise tab and click on your device. In the profiles window, you should see the Pairing Profile you created. Double-click on it, and bring up the same restrictions window you used to restrict pairing. Now, simply put a checkmark to allow pairing with non-Configurator hosts, and click Save. Click Refresh and revisit the setting to ensure that the change took. You can then disconnect your device and connect it up to any other machine to pair with it. (NOTE: If you run into issues, try power cycling the device for the setting to take). You should be prompted with a Trust dialog prior to pairing, just like old times. Just be sure to disable pairing again when you’re finished, using the same steps. The advantage to this technique is very good pairing security. In fact, in order to remove the supervision profile, the intruder would need to erase the contents of your device. Someone would need to have physical possession to and full access to both your iOS device and your desktop computer in order to undo this pairing lock to perform a forensic extraction or any other kind of analysis. The disadvantage is that you can’t simply decide you’re going to pair while you’re out somewhere. You can, if you made the profile removable, but then you’ll need to reinstall the profile to lock pairing again. Which will require a desktop. Pairing has to be a conscious decision, and takes time to verify that you have rights to the device’s content. Then again, shouldn’t it have always been this way? It’s a bit of a chore, but is well worth the added security.